Autoethnography is a type of research that uses writing and self-examination to explore far-ranging cultural, political, and social issues through personal experience. It is a qualitative, reflexive, ethnographic method where the researcher is also the subject of inquiry. 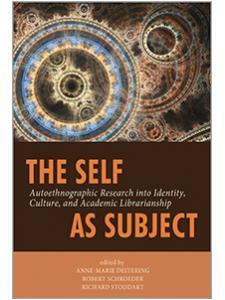 Using autoethnography as their research method, the 21 academic librarian authors of The Self as Subject: Autoethnographic Research into Identity, Culture, and Academic Librarianship investigate aspects of what it means to be a librarian. Starting with a reflective examination of themselves, they each investigate questions of culture, values, and identity. The Self as Subject presents a collection of reflective narratives that, taken together, explore the varied dimensions of librarianship in the present moment. It also examines autoethnography’s potential to help librarians answer questions that cannot be answered by traditional, empirical research methods and to reveal voices that are obscured by aggregations of data. All of the pieces in this volume share some characteristics: Each one is the result of a rigorous examination of the self and lived experience, and each one moves between the subjective and the cultural in its analysis. How the authors do this, however, varies widely—from a graphic novel to speculative fiction to rigorous academic analysis. The Self as Subject provides an opportunity to expand our understanding of rigor and the practice of research in LIS, and explores what it means to be a librarian in this age of disruptive change, and how the various identities and experiences we bring to our practice shape our experience of librarianship. The Self as Subject is for any librarian interested in research and research methods; the use of literary genres in research; alternatives to large empirical studies; questions of identity and social justice; and those looking to step out of their comfort zone and approach learning from a new and challenging vantage point. CHAPTER 15. Evaluative Criteria for Autoethnographic Research: Who’s to Judge? Anne-Marie Deitering is the Associate University Librarian for Learning Services at Oregon State University Libraries and Press, where she oversees the libraries’ Teaching and Engagement, Library Experience and Access, and Assessment departments and also oversees the Guin Library at the Hatfield Marine Science Center. She blogs at https://info-fetishist.org and tweets as @amlibrarian. Bob Schroeder is the Education Librarian at Portland State University. Rick Stoddart is an academic librarian at the University of Idaho.